The year is ending and two calendars for 2010 arrive from "data quality" companies, each with strange ideas about my postal address. I can't imagine what is supposed to have been in the field which output as "Other", and I celebrate my individuality, but not in this particular way. The address block (for my Dutch address) ends with a British postal code and "GB", struck out by the postal services to allow the mailing to reach me - eventually. 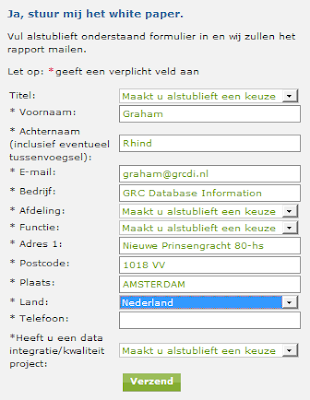 I recognise the postal code as that I use when I am provided with a web form which does not allow me to add my Dutch postal code. This company is happy to invite foreigners to its exhibitions, it just won't allow them to register without providing false data. I guess that this company uses a Spanish CRM system that only allows a Spanish postal code to be entered. To allow my (not at all Spanish) details to be entered they have added the least used Spanish code in the postal code field (for Melilla) and then put my Dutch code into the place name field. Remember, these are both data quality companies. I can see that I still have plenty of work to do to bring the message of our cultural diversity to all in 2010. Hey! Hang on a minute. Informatica have actually had the nous (British slang approximately meaning common sense, intelligence ...) to have pre-filled the form with my data (which they indeed already have in their system). And what's this? No state field? And yes, there's Montenegro in the country list, back in all its glory. Could this be a result in my crusade for better Internet data collection? I gingerly change the country to Canada and yes! The province field appears! Not in a sensible place, unfortunately (if you're going to change fields, don't change them where the customer has already been in the form - the country should be asked beforehand). But what can I say? RESULT! !